As Mililani is released in the Northwestern Hawaiian Islands, two more patients arrive at Ke Kai Ola for long-term care, including a yearling rescued in Kaua`i. Hawaiian monk seal RH38 at Ke Kai Ola. As part of the Center’s ongoing efforts to advance global ocean conservation and the recovery of endangered species like the Hawaiian monk seal, we recently admitted our first patient from Kaua‘i to Ke Kai Ola, our hospital and education facility in Kona, Hawai‘i. During the first half of the year, RH38 was spotted nearly every week on the north shore of Kaua‘i, and although she was a healthy size when she was weaned, a gradual decline in her body condition was noted over that time. In early August, the decision was made to intervene and The Marine Mammal Center was asked to help transport RH38 and admit her to Ke Kai Ola for diagnostics and treatment. With the Coast Guard’s help, RH38 was transported to Kona, where Dr. Johnson conducted an admit exam to collect blood and examine a minor wound on her left hind flipper. RH38 was kept separate from Awa`puhi, our current patient at Ke Kai Ola, to avoid any potential disease contamination until her test results indicated it was safe for the two animals to share a pool. Weighing about 88 pounds, RH38 had lost about half her size since being weaned. She also had a heavy infestation of tapeworms, which our veterinary team was able to treat once she began eating fish on day two. Heavy parasite loads have been shown to inhibit growth and even cause death in young Hawaiian monk seals at a time in their development when they are learning how to forage for food. Awa`puhi, the monk seal pup that has been in our care since June, is also continuing to improve. With the help of the animal care team at Ke Kai Ola, Awa`puhi successfully learned how to eat whole fish on her own and has doubled in size since her admit. Hawaiian monk seal Mililani at French Frigate Shoals. As RH38 was adjusting to her temporary home at Ke Kai Ola, recent patient Mililani was making her way back home to the Northwestern Hawaiian Islands after being in our care for just over two months. Ke Kai Ola Response Manager Sylvester Orosco accompanied the NOAA research vessel Hi`ialakai on its journey from the Main Hawaiian Islands out to the 1,200-mile archipelago of small islands and atolls that is home to about 1,100 endangered Hawaiian monk seals, nearly 80 percent of the entire population. Orosco and Mililani were dropped off at French Frigate Shoals so that Mililani could return to her island home. While Mililani adjusted to her surroundings, Orosco joined a small group of NOAA researchers to monitor her and the other monk seals in the area. A few weeks later, the Hi`ialakai returned from its travels to the remaining atolls and by then, Orosco and the NOAA team were satisfied that Mililani was doing well and had identified another yearling in need of rehabilitative care. 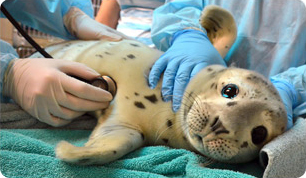 Named Koani pehu, or “moon flower,” the yearling female was thin and dehydrated in addition to having multiple puncture wounds, likely bites from other seals, on her shoulders and neck as well as some open cuts on her flippers. Once aboard the ship, she was given electrolytes and fluids and began treatment for parasites. Koani pehu immediately dove into the pool and appeared to be comfortable when she arrived at Ke Kai Ola. Her wounds have since healed and she is now eating fish on her own and starting to regain her strength. Hawaiian monk seal Koani pehu arrives at Ke Kai Ola. When Orosco and the team on the Hi`ialakai returned from the field with Koani pehu, they also brought news of healthy monk seal sightings, including former Ke Kai Ola patients Ama`ama, who was released in April 2016, as well as Niho`ole, Mea Ola and Ha`aheo, who were all released in May of this year. The resights are significant because they demonstrate the long-term impact of our work to save this species. Researchers estimate the current monk seal population to be about 1,400 animals, and about 30 percent of those monk seals are alive today directly due to conservation efforts. Since opening Ke Kai Ola three years ago, The Marine Mammal Center’s veterinary experts have successfully rehabilitated nearly two percent of this endangered population, returning 20 healthy monk seals to the wild with three more in our care now. Each one of these seals has the potential to have an exponential impact on population recovery. That means for every monk seal we’re able to save, donors can congratulate themselves for making it possible to truly help save this species from extinction. Support from you today will allow the three monk seals at our facility in Kona get the care and strength they need before returning to the islands of their birthplace. The Marine Mammal Center's team also monitors Hawaiian monk seal haul out activity on the island of Hawai‘i and manages rescue efforts for sick and injured seals reported to the hospital’s 24-hour hotline (808-987-0765). Hawaiian monk seal Koani pehu. It’s only thanks to generous donors like you that young Hawaiian monk seals like Koani pehu are able to get a second chance at life in the wild. You will make a real difference for this endangered species and all of the marine mammals in our care by making a life-saving gift today.